The mechanization of the ceramics industry in the early nineteenth century bore some of the first fruits of the Industrial Revolution. Table and decorative wares produced in series quickly became affordable to the growing middle class. As the century progressed, women slowly began to be employed in the ceramic factories as decorators, one of the few tasks in the new industrial order that became specifically associated with women. Decorating ceramics—or “china painting,” as it was then called—became one of the few ways in which single women could earn a dignified income. At the beginning of the last quarter of the nineteenth century, one enlightened English pottery factory owner, Henry Doulton, with the assistance of his colleagues John Bennett and John Sparkes, opened the Faience Department in his mechanized commercial pottery for the manufacture of hand-decorated art wares. As a social reformer, Doulton specifically sought to train and employ women. Later, in the United States, settlement houses and other charitable institutions also taught ceramic decoration as a trade to needy immigrant women. At the same time upper middle-class women found themselves with leisure time, and china painting became a hobby (a new social concept) that offered a means of artistic expression and filled idle hours with worthwhile work, imbued with the contemporary notion of self-improvement. In the twentieth century, women continued to work as decorators in factory settings. 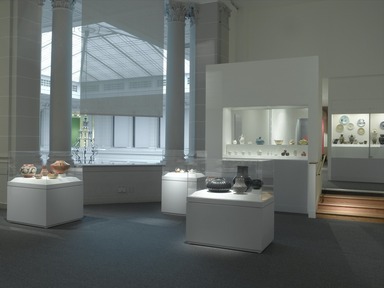 In addition, the art pottery movement of the late nineteenth century led to the development of studio pottery—unique pots created by single potters, including many women and sometimes married couples. In the last quarter of the twentieth century, the line between pottery and sculpture became blurred, as ceramics overcame its utilitarian bias and became an art form. 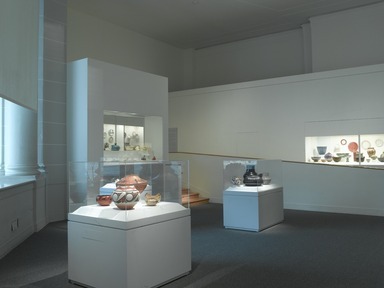 This installation of eighty objects from the permanent collection by women ceramicists includes pieces by North American, European, and Native American makers. The Eurocentric objects span the periods from the last quarter of the nineteenth century to the present and are interpreted in Aesthetic Movement, Arts and Crafts, early twentieth-century modernist, and contemporary styles. Both factory products and unique studio pieces are included. 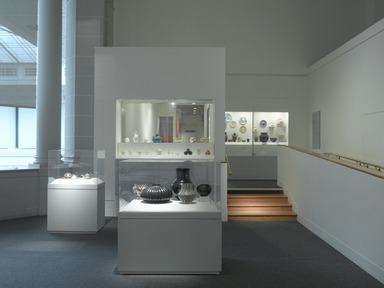 A representative group of objects by Eva Zeisel—the doyenne of American ceramicists, who celebrated her hundredth birthday in 2006—includes her early work in Germany from the 1920s and her first work in the United States after World War II. Of special interest are the Native American pots, which show the ongoing traditions of women ceramicists in these societies. Ceramics was an important vehicle for the propagation of both the Aesthetic and Arts and Crafts movements. Arising in England in the 1860s and soon spreading to the United States, both of these movements were reactions to industrialization and responses to ideas of design reform first espoused by John Ruskin and William Morris. Preaching that all objects could be imbued with beauty and that handwork was ennobling, their proponents were critical of the overwrought designs and poor quality of many factory-made objects. Aesthetically, the two movements were quite different. The Aesthetic Movement embraced exoticism, especially Asian art, and historicism in a rich combination of motifs and colors. The Arts and Crafts Movement, although influenced by the medieval past, espoused an art of spareness and simplicity often inspired by natural forms. A number of the Arts and Crafts works displayed here were made by members of the Saturday Evening Girls’ Club, a settlement house established in 1899 in the North End of Boston to aid poor Italian and Jewish immigrant girls. The club provided lectures and instruction in music, dance, and crafts. In 1908 Edith Brown, a ceramicist, established the Paul Revere Pottery for the girls. Eventually the pottery occupied independent quarters in Brighton, where simple wares were produced, often decorated with animals, landscapes, and homespun sayings. Many of the hand-decorated pieces by amateur china painters were done on white “blanks” that were made in Europe, especially France and Germany. After the blanks were decorated, they were refired in a kiln to fix the colors and make the design permanent. Often the backs of these pieces are impressed with the European maker of the blank and then inscribed by hand with the name of the decorator, the date, and sometimes the place where the decorator lived, and this information is included in the labels. In addition, some pieces were inscribed for special occasions such as Christmas or birthdays. Although Zeisel has spent the better part of her hundred-year life in the United States, her career before immigrating here was a peripatetic one that led her to artistic centers all over Europe. Trained as an artist in her native Budapest, Zeisel worked as a ceramicist in Schramberg, Germany, in the 1920s. There she designed modernist pottery in a Cubist-inspired mode for the large consumer market that also echoed the most up-to-date taste for streamlined forms and bright colors. In 1931, enticed by the Soviet dream of egalitarianism, she went to Russia, where she eventually worked at the Dulevo Factory, reportedly the largest pottery in the world. One of her assignments was to design a standardized dinner service that could be used throughout the country. She eventually was named art director of the China and Glass Industry of the Russian Republic. By 1937, however, the political climate had changed and foreigners had come under suspicion. After being imprisoned on false charges for sixteen months, Zeisel left for Vienna but had to flee the Nazis the following year, narrowly escaping to England with her soon-to-be husband, Hans Zeisel. The couple subsequently came to the United States. Zeisel’s unique ability to combine good design with the needs of factory production secured her success both as a teacher at Pratt Institute in Brooklyn and as an American industrial designer. Her work in the United States is marked by a new simplicity of form and an interest in biomorphism. She used the organic curves of nature for not only expressive but practical purposes: the contours enabled efficient factory production and ease of use for the consumer. Her “Museum” service, designed in 1942, debuted at the Museum of Modern Art in 1946, securing her reputation in her new homeland. Zeisel went on to design some of the most successful modernist dinner services for the large middle market of the post–World War II era. She has remained a vital designer to the present day, continuing to create new wares and to supervise the reissue of her classic mid-century dinner wares that speak to a new generation of consumers with the same sense of vitality and practicality. Native American women in the Southwest Pueblos of North America have been making pottery for more than two thousand years. Today the potters still dig their own clay, often at sites known only to them, and process it themselves. They use no wheels, employing only hand-built and coiled methods to make their pottery. The slips are made from ground ocher, natural plant pigments, and ground rocks, and firing is generally done in open fires (although a few potters today use kilns). Generations of women potters such as Nampeyo, Grace Chapella, Margaret Tafoya, and Maria Martinez have passed down these methods, shapes, and designs, preserving ancestral traditions and aesthetics while advancing the art form through innovation. Compare, for example, the work of the matriarch Nampeyo with that of her great granddaughter Dextra Nampeyo; both potters observe high standards of form and design. Pottery is essential to native life, with vessels functioning as keepers of traditional ways. Pots serve not only utilitarian but religious purposes: the tactile handling of pots provides emotional and spiritual awareness for religious participants. For the contemporary potters such as Roxanne Swentzell, Jody Naranjo, and Gladys Paquin, pottery may also provide a living and fame as they compete outside their native communities and enter the art marketplace through festivals, Indian markets such as that in Santa Fe, and art galleries. One of the most interesting developments in pottery making is the creative ability of Native American potters to be inspired by ancient designs to invent personal contemporary variations. Grace Chapella developed her butterfly designs from examining pottery shards from thousand-year-old Sikyatki ruins located near Tewa Village, Arizona. Nampeyo and her great granddaughter, Dextra Quotskuyva Nampeyo, painted traditional Hopi symbols such as tadpoles, ears of corn, insects, rain, water, and feathers, but each used her own creative forms and motifs. Gladys Paquin researched museum collections to inspire her bold, free-flowing geometric designs that swirl around her traditional-shaped water vessels. Mary Juan, exemplifying the best of the Maricopa potters, led a 1940s pottery revival by changing older, tiny interlocking designs into new, smooth-flowing red and black snakes, scrolls, and water shapes. A very contemporary approach to pottery by Jody Naranjo maintains the traditional jar shape in earth tones instead of traditional red and decorates it with humorous deer and birds executed in her own sgrafitto method of incised designs. The pottery on view in this case epitomizes the many variations that Native American women potters achieve in molding sculptural forms and painting with black and white. Maria and Juan Martinez established Santa Clara pottery as an art form with the new use of highly polished black surfaces interspersed with matte areas in their designs. Helen Shupla’s melon bowl, one of the largest she ever made, uses a similar high polish but relies on the rhythm of the melon’s ridges to cast shadow and light. Tafoya’s large pots with “rainbow bands” (the raised rings encircling the shoulders) and slim contours have bear’s-paw imagery drawn from a Santa Clara myth in which a bear was responsible for leading the people to water during a long drought. Grace Chino takes the traditional Pueblo water jar and embellishes it with playful, free-flowing designs modified from older Pueblo jars. The dazzling zigzag forms, designs modified from ancient Anasazi pottery, serve to emphasize the bulging shape of Lucy Lewis’s vessel. 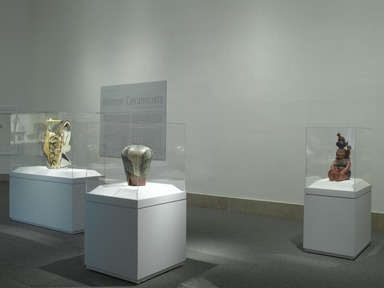 February 7, 2007 More than thirty female artists are included in An Art of Our Own: Women Ceramicists from the Permanent Collection, an installation of eighty objects presented in conjunction with the opening of the Elizabeth A. Sackler Center for Feminist Art at the Brooklyn Museum on March 23, 2007. An Art of Our Own includes work by well-known ceramicists but also presents works by little-known artists from Europe and North America, represented by a diverse selection of objects, that includes vases, bowls, plates, tea sets, and other vessels. Also on view will be examples of “china painting” by largely anonymous women working in the Aesthetic Movement and Arts and Crafts styles during the late nineteenth and early twentieth centuries, as well as works by Native American potters. The exhibition includes several pieces by Eva Zeisel, who has pioneered innovative design throughout the twentieth century. Born in Budapest in 1906, Zeisel has been designing ceramics for more than eighty years and continues to create new works. She has been honored with the National Design Award for Lifetime Achievement by the Cooper-Hewitt, National Design Museum, and has received an Honorary Doctorate from the Rhode Island School of Design. 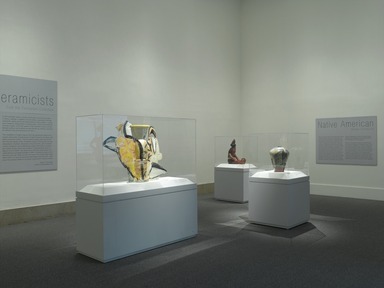 Among other artists represented in the installation are Beatrice Wood, Andrée Putman, Elsa Rady, Maija Grotell, and Betty Woodman. 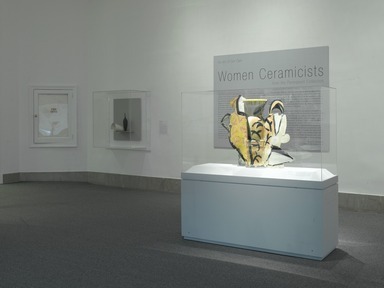 An Art of Our Own: Women Ceramicists from the Permanent Collection is organized by Barry R. Harwood, Curator of Decorative Arts.